In simple terms, automation means using technology to replace a process that would normally be done by a human. But automation has a wide range of applications across a wide range of industries and it can be difficult for business owners to know when this process of automating their business should be implemented. 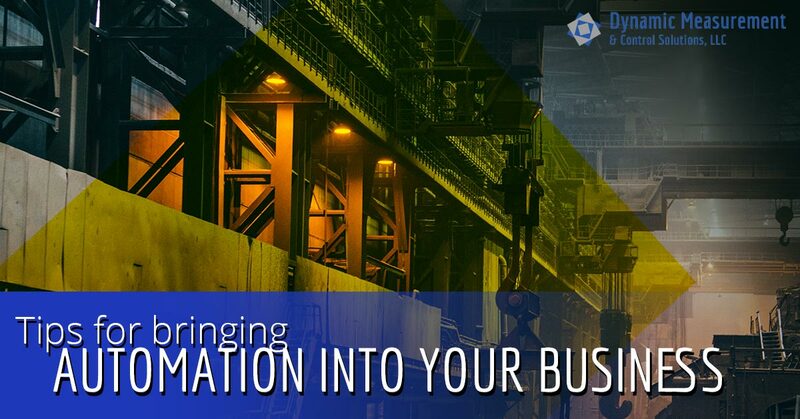 In this blog series, we’re going to give some helpful tips to business owners on how you can implement automation into your company in order to improve efficiency, safety, and much more. The majority of human tasks are repeatable whereas a small percent require judgment that can’t be replicated by a machine. As a business owner, you don’t want to automate too much of your company where there is no room for human judgement, and you don’t want to avoid automating altogether preventing your company from growing and being as efficient as possible. There’s a balance when it comes to implementing automation into your company and finding that balance should be your first priority. A good place to start would be to speak with your employees. Although you probably have a pretty good idea of what’s going on in your company, your employees will have helpful input on how automation could be implemented without disturbing any processes that are in place currently. Just remember that the goal is to have synergy between your employees and the automation software. Anything other than that could be catastrophic for your business. Without understanding a process in the first place, there would be no way to automate it. And that doesn’t just mean understanding what it does. You need to communicate closely with your employees to understand the benefits and faults of this process. You may find that it doesn’t actually need to be automated at all, or maybe it needs to be automated less than you originally thought. It’s better to take a good look at the process now and really understand what can be improved so that you don’t look back a year down the line and find out that you could have saved a lot of money or that your company was more productive without the automation. Another important thing to take into consideration are your legacy systems. Is your objective to completely eliminate these systems and replace them with modern ones, or do you want to find some way to make use of them? Rebuilding your system from the ground up will yield more efficiency but at a higher cost, whereas incorporating your old systems into your new one will result in higher short-term savings. Take your company’s current financial situation into consideration when determining what is most feasible. Safety is a huge concern when it comes to manufacturing automation and no matter whether you’re completely rebuilding your system or you’re just implementing new features, you’re going to need to ensure that it is safe to use. The Occupational Safety and Health Administration (OSHA) specifies what safety systems need to be in place to meet minimum requirements for your industry, and if you’re adding automation, complying with these laws should be one of your top priorities. If you’re like most business owners, you know what needs to get done, but you may not know who to go to make it happen — this is where we come in. At Dynamic Measurement & Control Solutions, we save you time, effort, and money by matching your company with the appropriate automated manufacturing company. We offer full-service consulting services to help you understand exactly what you need and where to get it. Contact us today. Read part two of this blog series to learn more automation tips.